The Company Will Discontinuing The Email Passwords Verification Feature Very Soon. Facebook is asking new users to provide their email passwords for account verification. Now the company has discontinued this feature for security reason. According to the media report a message has been flashing on some Facebook user’s log-in screen. If you continue using this, you will need to confirm your email with passwords. In this situation, some security experts say that this process may be risky behavior. 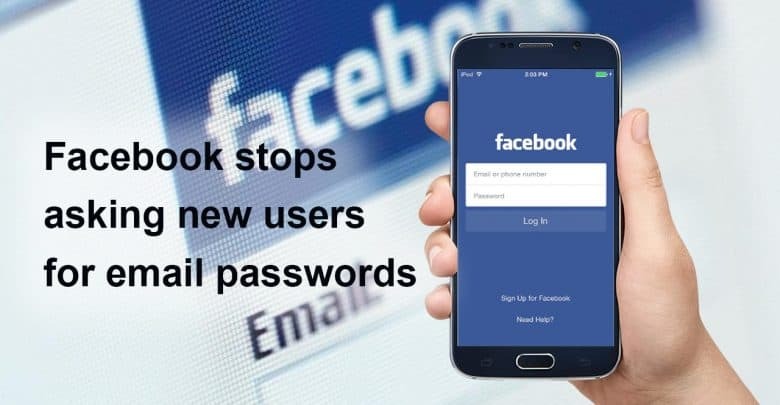 They also urged online people never to share their passwords or enter them into any services; this way people can avoid the risk of phishing attacks. In the previous year, Facebook reveals that 50 million accounts were hacked. For know the full news you can read: Facebook Reveals That 50 Million Accounts Have Been Hacked. According to the Daily Beast, people who are using the email such as Yandex and GMX. It asks to confirm your email address by entering their password when you are using Facebook. But if you are using Google’s Gmail, you don’t see the option, as it makes use of authorization tool OAuth. At first, a cybersecurity-focused on Twitter, user name e-sushi shared this message on the internet. Facebook is asking new users to share their email passwords when they were signing up. The tweet has subsequently shared throughout the internet, and security experts condemned Facebook for the breach of privacy. Bennett Cyphers, a security researcher said: “This is indistinguishable to a phishing attack.” He also said this is a lousy instance on so many levels. It’s an absurd overreach by Facebook and a cheap attempt to trick people into uploading data about their contacts to Facebook as the price of signing up. Even when you consent to upload contact information to Facebook, you should never have to put in your email password to do it. No company should ever be asking people for credentials like this, and you shouldn’t trust anyone that does. It goes against all conventional security wisdom, basic decency, and common sense.